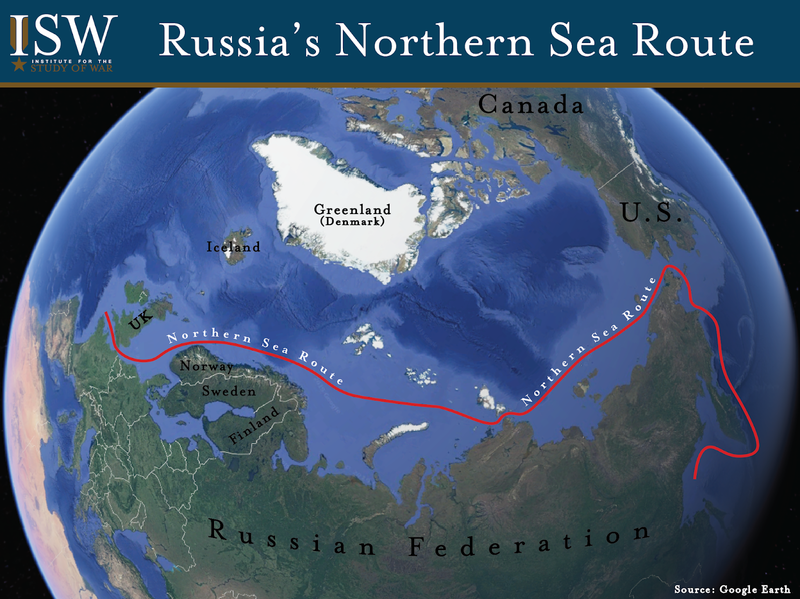 Russia is asserting its control over the Northern Sea Route (NSR) to secure access to future maritime trade and gain strategic advantage over the U.S. and China. Pro-Kremlin Izvestia reported on March 6 that new regulations would oblige foreign military vessels to notify Russia at least forty-five days in advance of their plans for transiting the Northern Sea Route and accept onboard pilots from Russia. The Kremlin has not yet confirmed these claims. Russian officials did previously announce work on legislation to restrict foreign naval access to the Arctic in November 2018, shortly after Russia attacked the Ukrainian Navy in the Kerch Strait connecting the Sea of Azov to the Black Sea. The Russian Parliament also granted Rosatom - the state-owned nuclear energy corporation - vast new authorities to manage and develop infrastructure, security, and trade along the Northern Sea Route in December 2018. Putin has ambitiously ordered his government to achieve an eight-fold increase in annual cargo traffic through the Northern Sea Route by 2024. The route is likely to become increasingly viable for commercial use given the melting polar icecaps, presenting new economic opportunities in global trade to Russia. The Kremlin intends to leverage its control over this emerging route to maximize its future economic benefit and gain strategic advantage over rivals in the Arctic such as the U.S. and China. The Kremlin likely views this effort as part of its larger campaign to expand its influence over major maritime shipping routes around the globe. The Kremlin was emboldened by the lack of response to its violent assertion of sovereignty over the Kerch Strait and will likely continue to contest international waters in the absence of pushback from the U.S. and NATO. Russia could pursue joint operations with China to achieve its goals in the Arctic. Russia lacks the financial resources to develop the Arctic. The Russian Ministry of Natural Resources’ development plan for the region called for investments of 10.5 trillion rubles (roughly $163 billion) drawn from private investment rather than the federal budget. Russia may attempt to secure part of this investment from China. China is a strategic competitor to Russia in the Arctic. It declared itself a ‘Near Arctic Power’ in its 2018 Arctic Policy and identified the ‘Polar Silk Road’ as an extension of its Belt and Road Initiative. China is keen to gain access to the Northern Sea Route to expedite its own shipments to Europe. The Kremlin’s short-term need for investment nonetheless might push it to cooperate (rather than compete) with China in the Arctic. China is a part owner of Russia’s large-scale liquid natural gas facility on the Yamal Peninsula and continues to invest in similar projects in the Far North. Chinese and Russian scientists agreed to cooperate on joint scientific exploration in the Arctic during a symposium in Beijing on March 25. Putin may secure further cooperation during upcoming meetings with Chinese President Xi Jinping in April and June 2019. China and Russia’s deepening cooperation could limit the freedom of movement of the U.S. in the Arctic. The U.S. should consider the potential implications of this cooperation as well as the precedent set by the Kremlin’s continued violations of international norms on maritime passage as the Pentagon prepares its updated Arctic Strategy. "Launch of Kharasaveyskoye Gas and Condensate Field," Kremlin, March 20, 2019, en.kremlin(. )ru/events/president/news/60113; “Gazprom Starts Kharasaveyskoye Development,” Oil and Gas Journal, March 21, 2019, https://www.ogj.com/articles/2019/03/gazprom-starts-kharasaveyskoye-development.html. [“Comprehensive Plan - ‘Implementation of the Mineral and Logistical Potential of the Arctic’ - Developed by the Ministry of Natural Resources of Russia, Sent to the Government of the Russian Federation,”] Russian Ministry of Natural Resources, March 13, 2019, http://mnr.gov(.)ru/press/news/kompleksnyy_plan_realizatsiya_mineralno_syrevogo_i_logisticheskogo_potentsiala_arktiki_razrabotannyy/. Lincoln Edson Flake, “Russia’s Security Intentions in a Melting Arctic,” INSS Military and Strategic Affairs Vol. 6, No. 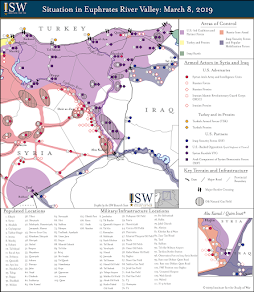 1 (March 2014), http://www.inss.org.il/wp-content/uploads/sites/2/systemfiles/SystemFiles/MASA6-1Eng%20(4)_Flake.pdf; [“Putin: Russian Priorities in the Arctic Are Unlikely to Change,”] TASS, March 30, 2017, https://tass(. 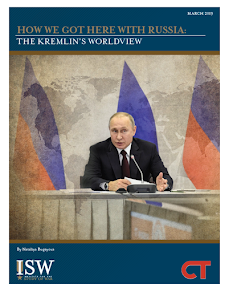 )ru/ekonomika/4139391; Aleksandr Pilyasov, [“Russian Arctic: State and Perspectives,”] Russian North, March 25, 2019, http://www.rosnord(.)ru/%0Bstrategy/standpoint/65-arktika-rossii-sostoyanie-i-perspektivy. Pilyasov, [“Russian Arctic: State and Perspectives,”] Russian North, http://www.rosnord(.)ru/%0Bstrategy/standpoint/65-arktika-rossii-sostoyanie-i-perspektivy. [“Putin Created the ‘Ministry of the Arctic’,”] Vzglyad, February 26, 2019, https://vz(.)ru/news/2019/2/26/966119.html. [“Military Camp for the Air Defense Forces of the Northern Fleet in Tiksi Is Ready for Occupation,”] TASS, March 13, 2019, https://tass(.)ru/armiya-i-opk/6211255. Bogdan Stepovoy and Aleksey Ramm, [“Triumph of the Arctic: The S-400 Is Prepared for the Polar Cold Weather,”] Izvestia, January 10, 2019, https://iz(. )ru/822659/bogdan-stepovoi-aleksei-ramm/triumf-arktiki-s-400-gotoviat-k-poliarnym-kholodam; [“The Russian Army in the Arctic Received the S-400 ‘Triumph’ and Pantsir-S Complexes,”] Interfax, December 30, 2018, https://www.interfax(. )ru/russia/644649; “Russia Will Deploy New Missiles to Defend Arctic, Admiral Says,” Moscow Times, March 13, 2019, https://www.themoscowtimes.com/2019/03/13/russia-will-deploy-new-missiles-to-defend-arctic-admiral-says-a64789; [“Security in the Arctic - Our Priority Task,”] Red Star, March 13, 2019, http://redstar(. )ru/bezopasnost-v-arktike-nasha-prioritetnaya-zadacha; Sergey Sukhankin, "The Arctic ‘Trilistnik’: Russia’s Bid for Regional Military Superiority," Jamestown Foundation, September 12, 2018, https://jamestown.org/program/the-arctic-trilistnik-russias-bid-for-regional-military-superiority/; Atle Staalesen, “Big Upgrade for Russian Northernmost Airstrip,” Barents Observer, September 26, 2018, https://thebarentsobserver.com/en/security/2018/09/big-upgrade-worlds-northernmost-airstrip; Mark Episkopos, “How Russia is Getting Ready for War in the Arctic,” National Interest, December 1, 2018, https://nationalinterest.org/blog/buzz/how-russia-getting-ready-war-arctic-37667. Dan Lamothe, “Trump Administration’s New Arctic Defense Strategy Expected to Zero In on Concerns About China,” Washington Post, March 15, 2019, https://www.washingtonpost.com/national-security/2019/03/15/trump-administrations-new-arctic-defense-strategy-expected-zero-concerns-about-china/. Aleksey Kozachenko, Bogdan Stepovoy, and Elnar Bainazarov, [“Cold War: Foreigners Are Given Northern Sea Route Passage Rules,”] Izvestia, March 6, 2019, https://iz(.)ru/852943/aleksei-kozachenko-bogdan-stepovoi-elnar-bainazarov/kholodnaia-volna-inostrantcam-sozdali-pravila-prokhoda-sevmorputi. “Russia Will Restrict Foreign Warships in Arctic Ocean, Defense Official Says,” Moscow Times, November 30, 2018, https://www.themoscowtimes.com/2018/11/30/russia-will-restrict-foreign-warships-in-arctic-ocean-defense-official-says-a63672. “On Amendments to Certain Legislative Acts of the Russian Federation,” Russian State Duma, December 28 2018, http://kremlin(.)ru/acts/news/59539. [“On the National Goals of the Strategic Objectives of the Development of the Russian Federation for the Period Up to 2024,”] March 16, 2019," Kremlin, March 16, 2019, http://static.kremlin(.)ru/media/acts/files/0001201805070038.pdf. “China’s Arctic Policy,” Chinese State Council, January 2018, http://english.gov(.)cn/archive/white_paper/2018/01/26/content_281476026660336.htm. [“Russian and Chinese Scientists Will Jointly Study the Ocean, the Arctic, and Antarctica,”] TASS, March 24, 2019, https://tass(.)ru/nauka/6252825. "Xi Jinping Accepts Putin's Invitation to Attend St. Petersburg Economic Forum Next Year," TASS, December 1, 2018, http://tass(. )com/politics/1033748; "Putin to Visit Beijing on April 26 - 27 for One Belt, One Road Summit," TASS, February 14, 2019, http://tass(. )com/economy/1044615.